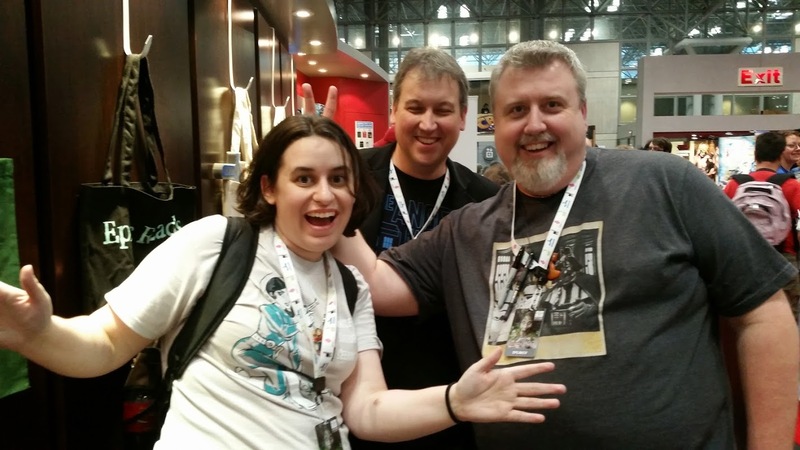 I was invited to attend this year’s New York Comic Con, and be on the “Not Your Mother’s Fairytale” panel, along with Harry Heckel, another Impulse author (half of Jack Heckel) I’d met previously and gotten along famously with. Now that I’ve caught my breath, here is a journal of my adventure and experiences. Spoiler alert: it was utterly mind blowing. Harper had events lined up for those of us attending the Con, starting with a get together on Thursday night. Readers and buyers from some bookstores would be in attendance, so I wanted to be there. Since I still have a day job, I couldn’t fly until Thursday night, but I was assured arriving a little late wouldn’t be a problem. I’d never been fashionably late to anything, so I was looking forward to it. I’d managed to get a direct flight, but of course the plane was late getting in, and then (also of course) there were mechanical issues. In all, we left about two hours late, not terrible, but not a great start to a weekend I was already nervous about. I made it to “Margaritas and Mayhem” fashionably late and was met by Caro Perny, a Harper publicist, who had my pass for the Con. She introduced me to my editor, Rebecca Lucash, who was a delight to meet in person. Communicating through email is effective, but it’s a limited medium. Rebecca’s sincere enthusiasm and excitement about The Stolen was, well, wonderfully surprising. As it turns out, she wasn’t the only one exuding that level of energy. Everyone I met from the Harper team (and I know I’m forgetting people, so please forgive me)—Pam Jaffee, Jessie Edwards, and David Pomerico—were genuinely happy to meet me and excited about my book(s). I mingled with Harper staff, writers, and reps from booksellers. Richard Kadrey, best-selling author of the Sandman Slim series, was nice beyond words. I also got to meet another Impulse author; Lexie Dunne, author of Superheroes Anonymous. The evening was fun and completely overwhelming. When I got back to my hotel, I slipped into a nice coma. Harper arranged a breakfast at their offices for the Harper authors attending the Con. Once I arrived, Rebecca met me and introduced me around. Agents, booksellers, Harper people (including my publicist, Camille Collins), and other authors chatted over bagels, lox, mimosas, and bloody marys. This was when I started feeling like a real author, not just someone who got lucky, and it was entirely because of the Harper team. I also had my first instance of being star struck when Neil Gaiman walked into the office and went upstairs. No, I didn’t meet him, but for a few minutes, I was a twelve-year-old seeing Superman walk by. And yes, those around me took much delight in my reaction. When the food and talk was done, it was time to head to the Con. I was prepared to hop in a cab and meet everyone there. Well, Harper had arranged for a super-stretched limo to ferry us authors in style. If you ever have the chance to be dropped off at the front entrance of the biggest Comic Con in the country in a big white limo, I encourage you to take it. Oh yes, I felt like I’d arrived in so many ways. Then I stepped inside. Once I got through the badge check, I couldn’t go anywhere without shifting and turning to keep from bumping into people. However, I noticed something wonderful right away and experienced all weekend: every time I bumped into someone, or someone bumped into me, we both turned and apologized to each other at the same time. I’m not sure where else in the world that would happen, but to me it says everything you need to know about the people in attendance. I arrived at the Harper booths and immediately saw my book on the shelf. There were also four large screens cycling through covers of books by the authors who were there, including mine. The “that’s pretty cool” meter continued to rise to new heights. Rebecca (my editor) and I ventured out into the Con to explore. The costumes on display were impressive, and I picked up my share of knick-knacks. There was too much to describe, but the Weta Workshop section was particularly impressive. 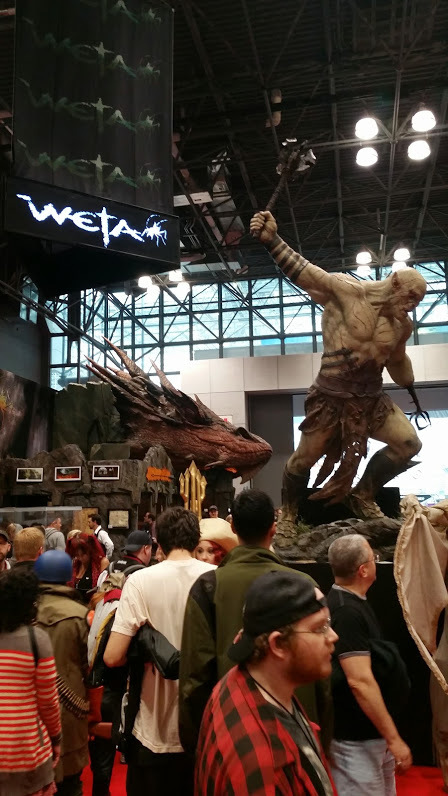 Yes, the life size Azog and Smaug’s head did help. After wandering, we returned to the Harper booth where I proceeded to push my book on anyone who got within ten feet of it. I’m proud to say we sold out of my stock that day. But more than that, I met some really great people, authors and readers alike. As an extra nudge to the “that’s pretty cool” meter, I was given a ticket to attend the Archer panel that night, which was hysterical. Then I went back to my hotel, had some dinner, and collapsed. I knew Harry was arriving Friday night, so I called to see if he wanted to meet at the Con. Turns out his drive up from Virginia didn’t go well and he was just coming into the city. After some breakfast, I headed to the Con, this time, sadly, by humble cab. 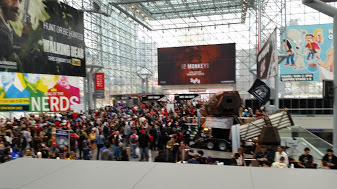 There were even more people there than on Friday, which I wasn’t sure was possible. I can only imagine the apoplexy the fire marshal experienced that weekend. As I was hanging out in Harper’s secret room—a small curtained-off area next to the booth—, Pam (the queen of publicity) gave me a number to call for an on-air interview with NonProductive Radio, which was doing a live podcast of the Con. Another tick on the “that’s pretty cool” meter. When Harry arrived, we wandered about before our panel. Upon our return, we did some shameless promoting of our respective books, and each other’s, and even got a few minutes to chat with Lexie (all of us utter professionals) before she headed out to explore with her family. At the appointed time, Harry and I were escorted to our panel by Rebecca and Jessie (his editor) and more awesomness ensued. I was seated next to Brian & Wendy Froud, whose faerie books are amazing, but their true claim to fame comes from their involvement in The Dark Crystal and Labyrinth movies. Oh, and Wendy designed Yoda! The “that’s pretty cool” meter exploded, covering the audience in a shower of its glittering remains. The panel was fun, and afterwards we were led to the signing area. There I sat next to Nicole Peeler, who was incredibly entertaining and possibly the coolest college professor ever. I spent some time chatting with Ben Tripp, easily the best dressed author I’ve ever met, as well as Naomi Novik, who is incredibly down to earth. When the signing was done, I returned to the Harper booth for a video interview with Sally from The Qwillery, who is about the nicest person you could ever meet. Then it was time for Harry and me to earn our keep and hawk some more books. When the day was done, he and I got some dinner before wishing each other well and calling it a night. The next morning I was on a plane and leaving it all behind like some fever dream. In all, it was an experience beyond description. I met the fabulous people who make up Harper Voyager, some incredible authors, and lots of amazing fans. I met so many great people who are aspiring writers, and I was struck by how much my story resonated with them and gave them hope to keep pursuing their dream. Harry and I encountered a group of such people after dinner as I was trying to get a cab. They’d attended our panel and recognized us! Yes, it was wonderful to taste a bit of celebrity, to sell some books, and to be on a panel. But the best part for me, by far, was meeting and connecting with so many people. Being published has been a dream come true, attending the Comic Con was like a dream within a dream were you are given endless punch and pie. My thanks to everyone who attended the panel, bought a book, and/or chatted with me for a couple minutes. Do you feel left out? Wish you could’ve seen the panel? As luck would have it, you can! 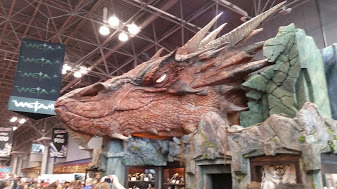 This entry was posted in Writer's Life and tagged American Faerie Tale, ComicCon, Writers by bishopoconnell. Bookmark the permalink. I was glad you were starstruck by Neil Gaiman. It made me feel better about being starstruck, too. And we are utter professionals, you’re completely right. This entry had me grinning the whole time. Thank you so much for sharing the adventure! Thanks for continuing to stop in!